In some situations, you must learn how to dial down your compliance. This may occur when you’re working in a group or in a meeting. It is important for you to speak up and take initiative. A person high in compliance is naturally task-oriented and process-oriented. Because of that, the compliance factor can morph into a hemorrhage on relationships. You need to dial down your compliance factor when you want to become more people-oriented and relationship-focused. Relationships require more than just informal guidelines and relationship standards. It is at those moments that the influence or the steadiness factors will help you build better relationships, whereas the compliance factor might hinder them. Another caution against the compliance factor is Groupthink. When you are leading a team, or if you are part of a team composed of elevated compliance individuals, you must watch out for Groupthink. Make yourself or someone else the Devil’s Advocate in the group. Unfortunately, the compliance factor causes that to happen in stressful situations. During those times, you need to dial down your compliance to allow your creativity and innovative nature to be unleashed. Throughout history, compliance to rules without contemplating new ways of thinking has proven disastrous. For a long time, scientists believed the Earth was flat and that the Sun revolved around our planet. The compliance factor can force people into a state of agreement, even when the facts prove otherwise. That is why the compliance factor must be tempered when it can negatively affect your performance or the performance of your team or organization. First, let’s examine some immediate steps that you can take to dial down your compliance factor. Try to incorporate these steps incrementally into your everyday life so you can build the skills for when you need to use them. You have to practice these steps to become comfortable with them and enhance your ability to situationally flex your behaviors. Question yourself when you are being close-minded. Ask yourself, do I need to hammer my point home by quoting the rules? Am I forcing people to fall in line without thinking about what is best? Sometimes the compliance factor can force us to strictly adhere to the rules or our perceived guidelines of how things should be run. Allow yourself to listen to other people’s ideas, even when they go against the status quo. It is important to bring in new thoughts and solutions because the old way of doing things might be the wrong way. Keep an open mind and you will reap the benefits of your team members and help your organization, friends, or family. A great way to dial down the compliance factor is to question the authority parameters and rules. Questioning rules, policies, and procedures help create methods that are more effective when put into practice. As a society, we would not get anywhere without questioning the old ways of life and implementing new changes. Alter your perceptions so that you can become more efficient and think of better ways to accomplish tasks and responsibilities in your life. When you have an idea, make sure you speak up and offer your opinion into the discussion. You may feel that the group won’t listen to you anyway, so why bother speaking, but that may not the case. No matter what, get your ideas out there. The more you speak up and assert yourself, the more people will notice and pay attention to what you have to say. A word of caution: You cannot simply hammer down the rules and only talk about the guidelines. People will shut you out if you barrage them with policies and procedures when they are trying to brainstorm. You need to help foster an environment where a respectful debate is a norm. That means loosening up on the talk of rules and allowing for the brainstorming process to produce ideas. Save the rules for later in the Rational Decision-Making Process when your organization absolutely cannot break certain policies. Changing your behavior patterns and displaying it to other people will allow them to view you as more assertive and creative. If you want others to listen to you, dial down your compliance factor by speaking up and dialing up your dominance and steadiness factors at the same time so that you speak with thoughtful courage. It is a surefire way to get the attention of others. If you can effectively combine the aspect of dialing up dominance and steadiness while at the same time dialing down compliance factors, you are building a surefire behavior pattern for enhancing your leadership currency. Although you may like the analysis and planning parts of a project, volunteer for the creative part. If there is a PowerPoint or a poster that your company needs, volunteer to work on it. You may ask someone else to join in on your brainstorming efforts to help you along but expand your horizons and try that new part of the project. Even in your life, volunteering for more creative projects and tasks will give you new skills. You can learn a lot from helping to put together a fundraiser or assisting your children with a school project. Try to expand your horizons to enhance your creativity and build on your skills. If you usually play it safe and stick to what you know, try taking a risk on something new. Although it may take longer or may not be the most straightforward way of going about something, try it and see what happens. Although it may not be logical, it will be a good experience for you to open up your opportunities to see what it’s like to try something new. It is wisest to start small with your risk-taking ventures. Do something new that may lead either to rejection or to something minor that could embarrass you. Once you realize that taking risks can actually help you achieve more in your life, you will understand the benefit of taking risks when it can help you improve. If you do the same thing every day in the same order, rearrange it and try things at different times of the day. The compliance factor is associated with structure and organization. If you have both an elevated compliance and an elevated steadiness factor, this can lead to an unchanging environment where you have the same routine every day. You can change that monotonous routine by changing up the structure of your everyday life. You may feel that you have much more energy trying this new procedure and doing things out of order. Changing your routine can help enhance your creativity. The compliance factor often reduces your ability to develop a genuine rapport with others because the compliance factor is task-oriented and mainly more of an introverted behavior style. You have to develop a people-oriented approach when trying to build trust and rapport with your coworkers, clients, friends, and family. The best rapport-building techniques are mirroring and matching. Subconsciously, you trust others that move the way you do and have the same posture and stance as you. Use mirroring and matching to help become more empathetic to others by getting into their zone. I recommend viewing the sessions entitled Building Trust 1 and Building Trust 2 in the Life Skills Part 3 Course. After practicing the immediate steps in your life, try these secondary steps to build your ability to dial down the compliance factor. As you continue to practice these secondary steps, assemble a knowledge base of useful information about dialing down the compliance factor that can help you achieve your goals. There are four main biases that affect the compliance factor. The first is the framing bias. The compliance-based individual typically frames everything around rules and guidelines with a strict need for organization. The second bias is the confirmation bias. This is when the compliance individual looks for proof that the rules work, rather than looking at how to improve them. The third bias is the anchoring bias. When in an argument, a compliant person will anchor on the rules, hammering down the point so that no debate can take place. The fourth and final bias typically associated with the compliance factor is called deformation professionals. This is the tendency to listen only to those in your profession or to a certain person about issues. You must confront your biases and learn to question them when they affect your judgment of an issue. Unfortunately, deformation professionals affect many college students who are trying to abide by the perceived guidelines of their chosen professions. One student that I know currently wants to attend a top 10 law school because he spoke with a lawyer who told him that if he could get into a top 10 school, he should take it. Now, this student will not listen to anyone else about the matter because a lawyer told him what he should do. Even though going to a top 10 school will cost about $100,000 more than going to a top 50 school. This student’s mind is set because of the deformation professionnelle bias. We all need to be aware of how we can get so easily influenced by people that we respect or even people in professions that we respect. I recommend you review the Cognitive Biases sessions in the Decision-Making Course on the eLearning site. When starting a new project, try your best to start it yourself and see where it goes rather than stopping and asking for help or reassurance that you’re on track. You’ll be very proud of your efforts after you’re done if you do it all yourself and figure it out on your own. An initiative is one of the qualities that your bosses look for when assessing who they are going to promote or give a raise too. Show initiative and you will impress your bosses and your peers. Instead of focusing on the rules, try to focus on people’s behaviors. There are always times in our lives when we know that the rules are hindering people’s ability to get their jobs done. Sometimes our own structure can affect the behaviors of other people in ways that we did not previously think. Take the time to examine the benefits and consequences of rules and their effect on behavior to influence positive change in your organization or life. If you focus on rules instead of behaviors, you will inevitably kill the momentum of your organization, social structure, or family life. The only people that will be able to survive in your world are other elevated compliance individuals. This can be disastrous for organizations that need to focus on innovation. Some of the defense companies have seen this happen over recent years. During the expanded growth in defense after 9/11, the defense companies grew so rapidly that they had to put new rules in place to prevent low-quality results. Now that the economy is weaker, their rules are actually hindering their ability to become innovative and make money. Organizations have to focus on how the rules are affecting their people depending on the economic, social, and other situations in their business environment. The compliance factor focuses on the smaller details and the working structure of projects or tasks. When you need to establish a vision, you have to look at the big picture. See how all the parts fit together before working on each specific part. In this way, you will have a better idea of how to accomplish your tasks and improve the project or task. I recommend you review the Bull’s Eye Model in the supplementary activities section to understand how the motivation to keep a rule changes as you move out through each level of the model. You start with YOU and the motivation to keep the rule. You may think it helps you do your job easier or keep everything organized. 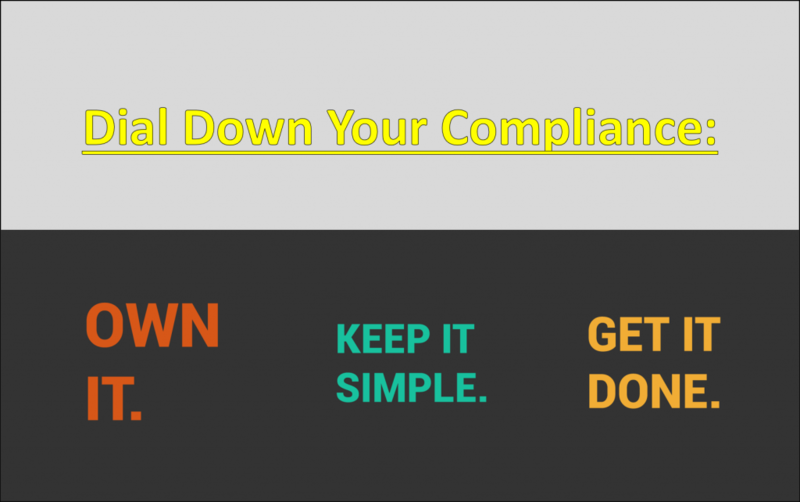 I hope you have enjoyed the steps on how to dial down your compliance factor. Be sure to incorporate each of the four primary factors into your life as the situation warrants. Behavioral flexibility is the key to your success.